This is something that four of us did during our hack week in early January, but how did it all come together? In late October, a video from MIT was making the rounds around at Clearpath. Since we usually have a lot of robots on hand and like doing interesting demos, we reached out to Shayegan to see if we could get some background information. He provided some insights into the challenges he faced when implementing this, and I was convinced that our team could pull a similar demo together so we could see how it worked in person. 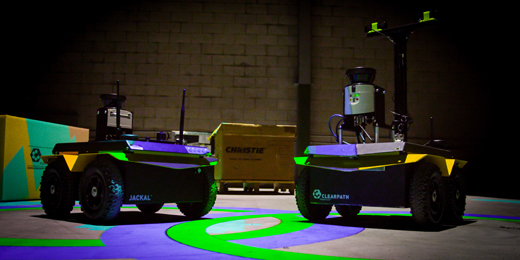 In MIT’s case, they have a combination of iRobot Creates and quadrotors as their robot fleet, a VICON motion capture system for determining robot location, a Windows computer running ROS in a virtual machine as well as projector edge-blending software, and a set of 6 projectors for the lab. There were three things we wanted to improve on for our demo. First, we wanted to run all-ROS, and use RViz for visualizations. That removes the performance hit from running RViz in a VM, and also means that any visualization plugins we came up with could be used anywhere Clearpath uses ROS. Second, we wanted to avoid using the VICON system. Though we have a VICON system on hand in our lab and are big fans, we were already using it for some long-term navigation characterization at the time, so it wasn’t available to us. Finally, we wanted to make the demo more interactive. Improvement #1: All-ROS, all the time! To get this taken care of, we needed a way to either run edge-blending software on Linux, or to use projectors that did the edge blending themselves. Fortunately, something that might be a little known fact to our regular audience is that Christie is about 10 minutes away from Clearpath HQ and they make some of the best digital projectors in the world that, yes, do edge blending and more. A few emails back and forth, and they were in! For this project, Christie arrived with four Christie HD14K-M 14,000 lumens DLP® projectors and two cameras. The projectors use Christie AutoCal™ software and have Christie Twist™ software embedded right in. Christie rigged the four projectors in a 2 x 2 configuration on the ceiling of our warehouse. The cameras captured what was happening on the floor and sent that information on the Christie AutoCal™ software, which then automatically aligned and blended the four projectors into one giant seamless 30 foot projection mapped digital campus. Getting rid of the motion capture system was even easier. We already have localization and mapping software for our robots and the Jackals we had on hand already had LIDARs mounted. 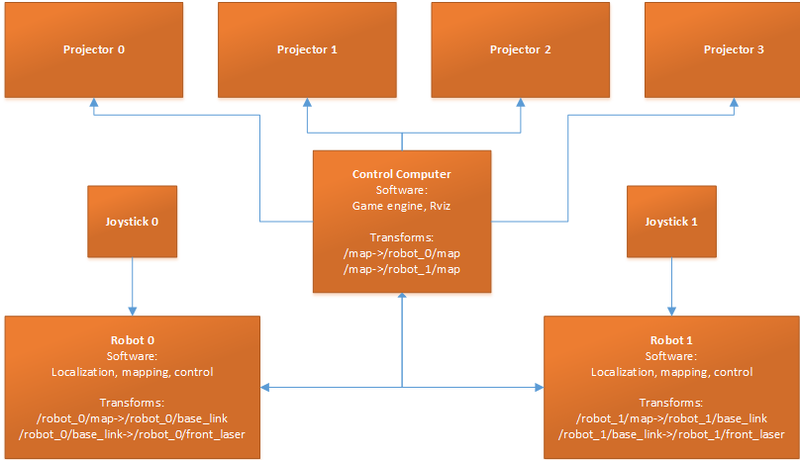 It was a relatively simple matter to map out the world we’d operate in and share the map between the two robots. All we had to do to sync the robot position and the projector position was to start training the map from a marked (0,0,0) point on the floor. This was the fun part. We had two robots and everyone loves video games, so we wrote a new package that uses Python (via rospy), GDAL, and Shapely to create a real-life PvP game with our Jackals. Each Jackal was controlled by a person and had the usual features we all expect from video games – weapons, recharging shields, hitpoints, and sound effects. All of the data was rendered and projected in real-time along with our robots’ understanding of their environment. And, as a final bonus, we used our existing path planning code to create a entire “AI” for the robots. Since the robots already know where they are and how to plan paths, this part was done in literally minutes. How do I get one for myself? Robots: Obviously, we sell these. I’d personally like to see this redone with Grizzlies. Projectors: I’m sure there are open-source options or other prosumer options similar to how MIT did it, but if you want it done really well, Christie will be happy to help. Software: There is an experimental RViz branch here which enables four extra output windows from RViz. The majority of the on-robot software is either standard with the Jackal or is slightly modified to accommodate the multi-robot situation (and can also be found at our Jackal github repository). We intend on contributing our RViz plugins back, but they too are a little messy. Fortunately, there’s a good general tutorial here on creating new plugins. If you’re a large school or a research group, please get in touch directly or send an email to sales@clearpathrobotics.com and we’ll see how we can help.